Gateway 97.8 (formerly branded as Gateway FM) is the brand name of a UK-based Community Radio station serving the areas of Basildon and East Thurrock. It succeeds Radio Basildon, a popular cable service that broadcast on Rediffusion channel A from the late 70's until the eighties and gave Basildon its first taste of really local radio. Some of the broadcasters from that cable station contribute to the area's latest local radio, although this time on FM. 'Gateway FM' ran six 28-day RSLs (restricted service licence broadcasts) on 87.7(FM), as well as on-line simulcasts (simultaneous webcasts) over the three years prior to the Company securing its full FM licence. The Company was officially formed on 29 June 2006 as Gateway Community Media Community Interest Company (CIC). Having applied successfully to the industry regulator (Ofcom), the Company was awarded a Community Radio broadcast licence for five years and launched its re-branded Gateway 97.8 service on the 25th of September 2010, wit h the new branding reflecting its frequency of 97.8. The station had been committed to a policy of delivering social gain from its earliest days. By the time it secured its 5-year licence it had already delivered an extensive series of educational courses involving various local schools. Once on air full-time, the Company secured recognition as an accredited centre for OCN and NCFE in order to be able to deliver nationally recognised media skills courses. Since its launch, the station has expanded its membership and secured wider recognition locally and nationally. It was the proud recipient of a The Big Society Award in 2011. This prestigious award is in the gift of the Prime Minister, David Cameron. Indeed, he broke away from other pressing duties while on a pre-Christmas visit to Afghanistan to announce the Award. In 2012 the Company was awarded The Queen's Award for Volunteering in recognition of the dedication of its members in the service of the wider community. This unique UK National Honour was created by Her Majesty to mark her Golden Jubilee in 2002 and to recognise the outstanding contributions made to local communities by groups of volunteers. It has the equivalent status to that of a single MBE granted to an individual and sets the national benchmark for excellence in volunteering, with the work of those awarded being judged to be of the highest standard. Gateway 97.8 provides showcase opportunities for local musicians to get heard by a wider audience through its hourly 'Local Artist' slot from 7am to 7pm each weekday. Similarly it offers free promotion opportunities to local charities, self-help groups, clubs, societies and other not-for-profit socially beneficial enterprises. It also offers a range of radio related courses and opportunities, in conjunction with other organisations as well as directly for members. Membership fees are pegged at just £1 a year in order to make membership benefits readily available to all. As a local station, it has a distinct focus on covering local news, views, events and opportunities. In addition to its broadcasting, including weekly features from its studio within a local school, its outreach activities involve the volunteers on the 'roadshow' that goes out to many community events throughout the year in order to provide music, entertainment. The station currently has five broadcast studio locations, a training and a preparation studio as well as two further broadcast studios pending and the probability of a further one. The station has the facilities to be able to host and teach the OCN level 1, and level 2 qualifications in radio broadcasting as well as NCFE courses to Level 3. On 24 February 2010, Gateway 97.8 was awarded a five-year community broadcasting licence by Ofcom. The station started its 28-day testing period on 28 August 2010 and launched on 25 September 2010. Gateway 97.8 is known locally for its daytime shows such as Gateway Gold, The Brighter Breakfast, Daytime, Good Afternoon and Drivetime, as well as specialist music shows and those identifying with minority group interests. These are some of the presenters at the station, both past and present: Ali Stafford, Alison Haythornwaite, Anthonia Orimolade, Arfer Johnson, Ashwyn Smyth, Ayebea Crentsil, Cat Norris, Charles Peck, Danny Lawrence, David Fenn, Gary Lincoln, Gonzo, Harry Carnaby, Jack Sullivan, Josh Dubovie, Jules Little, Kurt Wilson, Louis Beeden, Mark Crosby, Mark Hardie, Matt Suckling, Mike Barlow, Neil Matthew, Richard Becker, Richard Yates, Ros Connors, Ryan Beeden, Ryan Stokes, Sarah Wathan, Tahra Malik, Tom Berry, Tony Weaver, Yvonne Williams, Zach Watson. Gateway 97.8 presenters view their role as temporary stewardship of a Gateway 97.8 time-slot with a duty to provide informative, interesting and entertaining radio whilst seeking to mentor their potential successors. The station has received many accolades including the Princess Diana 'award of excellence', and for other contributions to the community. The Big Society Award from the Prime Minister, David Cameron in 2011. The Queen's Award for Voluntary Service in 2012. Its members have accrued a worthy selection of Princess Diana and Essex Arts Awards. On May 17, 2011, the station was first visited by HRH The Duke of Gloucester prior to his opening Basildon's new sporting village in the nearby Gloucester Park. He also featured on 'Good Afternoon', a programme hosted by the chair of the station, for around 10 minutes. Moments before, he had presented three Princess Diana 'award of excellence' certificates to three volunteers at the station - to add to the considerable number of awards already earned by members. Gateway Community Media plans development into a full multi-media "hub" to include a main television studio and additional studio, learning, news gathering, production and tutorial areas. Detailed structural, budgetary and business plans have not yet been published. 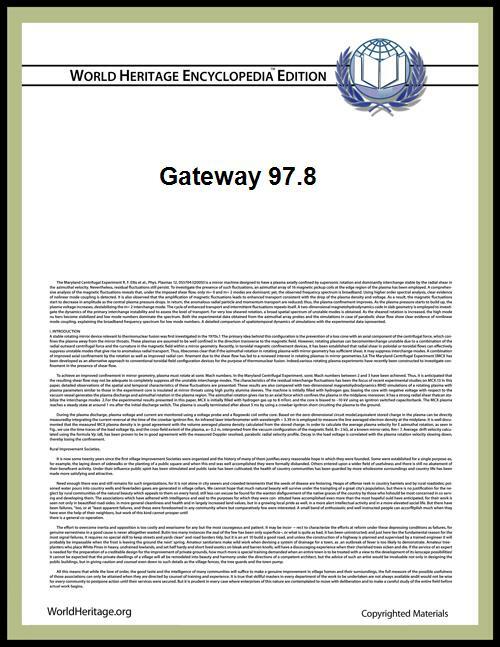 Gateway 97.8 fits into that plan as the radio broadcasting strand that interfaces strongly with the Internet strand. The station can be heard strongly across Basildon Borough on 97.8 FM including the areas of Pitsea and Laindon, with fair reception through Wickford and Billericay. In addition reception is strong through East Thurrock areas such as Corringham, Stanford-le-Hope and East Tilbury. Reception is fair throughout Benfleet, on Canvey Island and along the A130 much of the way to Chelmsford; along the A127 and A13 corridors most of the way to the M25 and much of the way to Brentwood. Although beyond its planned reach, it can be heard in South Woodham Ferrers.